Welcome to your Wisconsin Dells Attractions! 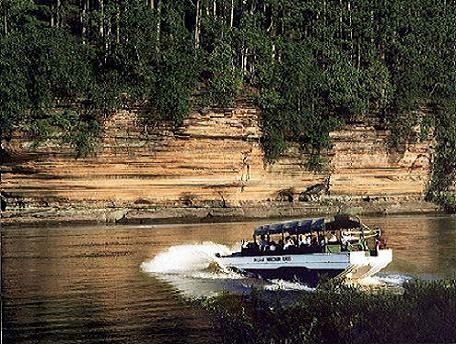 The Dells is a unique family friendly vacation destination for kids and adults of all ages. We are not just a summer vacation spot anymore! Over the past several years, the Dells has exploded into an indoor and outdoor resort area that’s happening 365 days a year. Leave the planning on the fly to the tourists. Explore the Dells today so you enjoy every single family vacation moment upon your arrival. Let us introduce ourselves. We are not travel consultants or agents. We are people just like you and wish to share our ongoing family vacation experiences in the Dells, but without all the hype. Whether you prefer the natural scenic beauty of the north woods or the endless exciting attractions, we invite you to join us for a vacation that will create memories your family will remember year after year. Did you say Water Park! The Dells has much more to offer than just water parks! The hundreds of other attractions and unique shopping on Main Street are just some of the reasons Wisconsin Dells Attractions is one of the most visited vacation areas in the country! Wisconsin Dells Attractions is an enormously popular year round attraction for family vacationers and offers great lodging choices at hundreds of hotels, motels, resorts, and campgrounds. When you’re hungry, choose from the simplicity of fast food, a family outing with a Northwood’s theme, or an elegant romantic dining experience overlooking the Wisconsin River. The Dells really has every type of lodging and eating options for every family. Go Ahead "Dive" into the Dells! The Wisconsin Dells Blog keeps you up-to-date with all the specials, coupons, additions, updates, and changes to the wisconsin-dells-attractions.com Web site. Subscribe here. Visit the Wisconsin Dells Water Parks and Resorts for a vacation of a lifetime! Noahs Ark Water Park in Wisconsin Dells Wi - Is America’s largest outdoor water park. Family vacation guide includes water rides, prices, coupons, location and photos. Circus World Museum - The big top show lasted nearly an hour and included tigers, elephants, dogs, magicians, juggling, clowns, acrobats and more. Wisconsin Dells Resorts - Guide to all the resorts in the Wisconsin Dells area. Treasure Island Wisconsin Dells Wi - Excellent year round family resort adventure with four new amazing indoor - outdoor theme and water parks. Sundara Spa Wisconsin Dells - More than just the spa, offering some of the nicest overnight accommodations available in the Dells. Ho Chunk Casino Wisconsin Dells Wi - Vegas style casino and bingo gaming includes superior resort style hotel. Wisconsin Dells Hotels - Links to all the most popular hotels in the Wisconsin Dells. Wisconsin Dells Motels - Check out this guide to the popular motel locations in the Wisconsin Dells area. Wisconsin Dells Cabins - Guide to fun and relaxation in the Wisconsin Dells area water parks, resorts, hotels, campgrounds, restaurants, and much more. Wisconsin Dells Campground - Guide to camping in the dells from rustic to resort sites. Family vacation attractions for water parks, theme parks, and restaurants. Original Wisconsin Ducks - A trip to the Wisconsin Dells would just not be complete without a tour on the famous amphibious Ducks. Wisconsin Dells Restaurants - The Dells offers great eating choices at hundreds of area restaurants from renowned steakhouses to casual family-friendly pizza parlors. Tanger Outlet Mall Wisconsin Dells - Over 60 name brand outlet stores in open rustic timber framed northwoods atmosphere. Wisconsin Dells Coupon for area attractions, water parks, resorts, hotels, motels, campgrounds, restaurants, and more. Wisconsin Dells Discount for area attractions, water parks, resorts, hotels, motels, campgrounds, restaurants, and more. Wisconsin Dells Map and family vacation guide to fun and relaxation in the Dells area water parks, resorts, hotels, campgrounds, and restaurants. Would you like to share your knowledge about wisconsin dells attractions? Great, find out how you can submit your story or tip here.